I recently got a few complaints that users experience very high CPU load in a GRID enviroment when using specific browsers and watching Youtube videos. So what is reason for this? 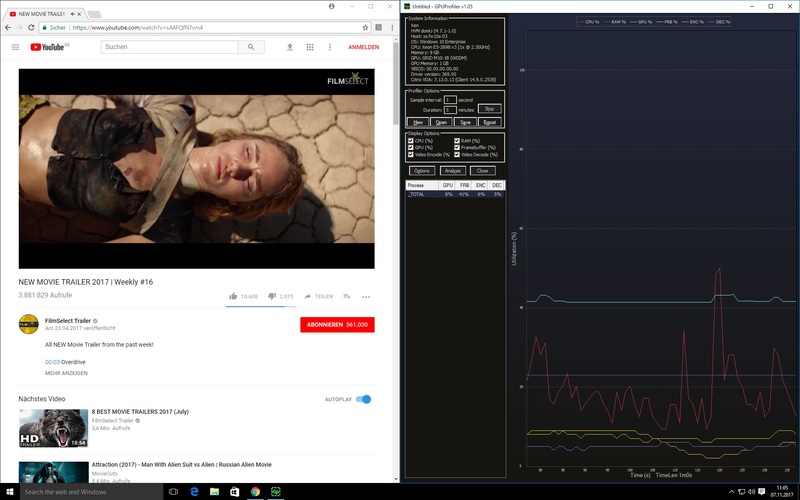 Youtube moved away from H.264 decoded videos and now provides VP9 decoded videos as default for browsers like Chrome and Firefox. Unfortunately the widely distributed Maxwell Tesla boards (M10, M60, M6) don’t provide VP9 hardware decoding yet and therefore the whole decoding needs to be done with the CPU and depending on the resolution of the video this might result in very high CPU utilization. So what can we do to improve this situation? In the past the Youtube videos have been shown in H.264 and the Tesla boards are capable of decoding H.264 in hardware so could try to revert to H.264 to leverage the Tesla boards for decoding instead of the CPU. That said there are browser plugins available to use H.264 decoding instead of VP9 and that is exactly what we wanna achieve. There are plugins for Chrome and Firefox available. So just give it a try and check the difference in CPU usage. This is really a game changer especially for RDSH deployments. I created two screenshots to show the difference in CPU usage and decoder utilization with/without H264ify plugin enabled in Chrome. As you can see the CPU load with H264ify is less than half compared to the without H264ify. And we can also see that we have decoding load on the first image and no decoding load on the second. Is there also a workaround for Internet Explorer and Edge?